Pioneers in the industry, we offer hplc column cosmosil by nacalai tesque, cosmosil hplc column and hplc column selection guide ( nacalai tesque) from India. COSMOSIL 5C18-MS-II is a monomeric type of C18 phase. A new end capping treatment with polar groups for "shield effect" has extended the pH range and significantly improved peak shape for basic compounds. This phase is recommended for most of the applications but particularly effective for low molecular weight organic compounds. COSMOSIL 5C18-AR-II is a polymeric type of C18 phase. It shows exceptional stability and long lifetime at low pH. This phase is recommended for the separations requiring acidic mobile phase conditions. It also shows superior molecular shape selectivity to monomeric type C18 columns. COSMOSIL 5C18-PAQ is designed to offer superior retention of polar compounds and excellent reproducibility in highly aqueous mobile phases, even in 100% aqueous. Conventionally aminopropyl bonded stationary phases are used for liquid chromatographic analysis of mono and oligosaccharides.General shortcomings of the conventional aminopropyl bonded phases are tailing and adsorption of certain saccharides and general low durability (short active life) of these columns. These problems are addressed and solved by the novel COSMOSIL Sugar-D, resulting in better (sharper) separation and much-improved durability. In addition COSMOSIL Sugar-D is useful for the separation of highly hydrophilic compounds which are not retained in conventional octadecyl (ODS) bonded stationary phases. 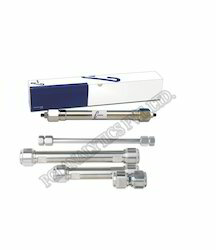 Looking for HPLC Columns ?